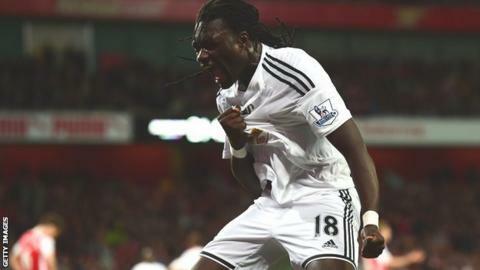 Swansea City's positive record at the Emirates Stadium is giving their players heart ahead of facing Arsenal. The Swans have only lost once away to Arsene Wenger's side in the Premier League and stunned the title contenders last term with a 1-0 victory. "Arsenal are up there fighting for the title and they are very dangerous at home," ex-Gunner Lukasz Fabianski explained. "But we like to play against them and we hope it can be a good game for us." Fabianski was in inspired form in Swansea's 2-1 defeat at Tottenham, making 12 saves to almost give the Swans a first ever win at White Hart Lane. But with Swansea just three points outside the relegation zone, the Polish goalkeeper admits his side need a win, not just a brave performance in north London. "Before the game we were aiming to beat Tottenham and we will approach Arsenal the same way, aiming for three points," he said. "I guess we try and shake it off straight away, there is no time to dwell on the result (at Tottenham). "It was a memorable game for us last season at the Emirates and hopefully we can get something again." Fabianski's confidence is shared by midfielder Ki Sung-yueng. "We like playing at Arsenal," he explained. "We have good memories of good games at Arsenal, so who knows? "We will always create two or three chances in a game and need to do that against Arsenal. "We have 11 games left, so every single game is now massive for us. "If they (Arsenal) lose against us, (it is) hard for them to challenge for the title."